Our area search facility categorises property by administrative area, known in Thai as an Amphur (or Amphoe อำเภอ). 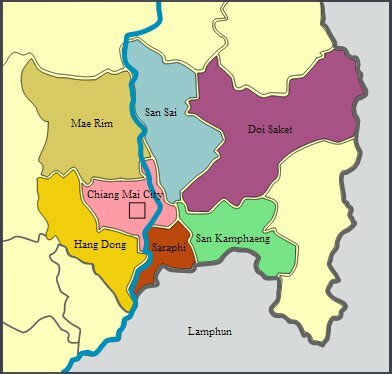 Chiang Mai city itself is known as Amphur Muang (or Muang เมือง) which is the traditional Thai name for the provinces central city district. Use your mouse to select an area either from the map or the list of Amphurs alongside it.